The Überchassis, also known simply as the UC, is a human luxury sportscar which seats five. The vehicle has two front seats and a three person bench seat in the back. Billed as the "Quintessential Auto Experience", the Überchassis has widely been held as the standard-bearer for sport luxury vehicles. The vehicle routinely employs exotic drivetrain configurations and propulsion systems to stay on the cutting edge of transportation science. The Überchassis is popular among Earth and several of the Inner Colonies, with many being found in the city of Mombasa in 2552. Despite the claims of both vehicles' respective manufacturers, the Überchassis and MLX have similar capabilities. 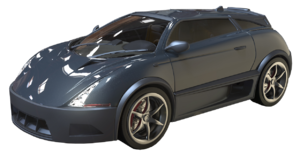 There is a reference to this car in the level, Terminal, when the male announcer says, "Will the owner of the brown Überchassis, license code P0-WND, please return to your vehicle." On the license plate, it reads "P0-WND". This is a reference to "Pwned" or "owned", which is common gamer slang. The Überchassis in Halo 2. Frontal view of the Überchassis car. Rear view of the Überchassis car. Concept art of the Überchassis car for Halo 2: Anniversary.